The Savile Row Bespoke Association (SRBA) is delighted to be able to confirm further details of the apprenticeship initiative it has developed in association with tailoring companies throughout the UK. The new Bespoke Tailoring and Cutting Level 5 Diploma forms a part of the Government ratified Trailblazer training scheme and will commence at colleges throughout the UK at the start of 2017/2018 academic year. 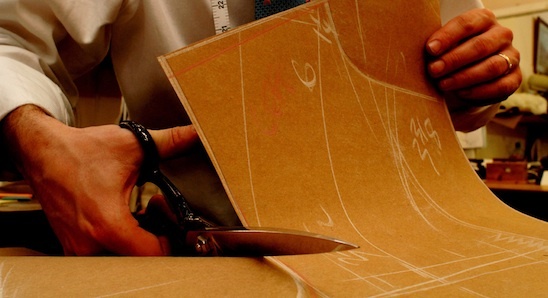 The Level 5 Diploma follows on from the existing Level 3 Diploma and will produce qualified bespoke tailors and cutters who are able to cut a unique pattern, create a garment mainly by hand while satisfying customers’ individual requirements. A recent renaissance in bespoke British tailoring has led to an increased demand for young trainees to uphold Savile Row’s exacting standards and iconic reputation. Ten years ago and in response to this need Philip Parker, Vice Chairman of SRBA founding member Henry Poole & Co and Su Thomas, Director of the SRBA, reinvigorated the traditional apprenticeship with a scheme which offered mentoring by master craftsmen, with the skills learnt offering a passport to bespoke tailoring jobs throughout the world. Since 2004, 55 apprentices have been trained through this scheme. They are providing a generation of skilled craftsmen who have reduced the average age of tailors on the Row and shifted the gender balance; over 65% of recently trained tailors are women. The new Level 5 apprenticeship has been developed through building on the success of this training.